How Often Can Cattle Feeders Hedge a Profit with Futures? Collection of county yield data, how does NASS do it? Dairy: Milk Production drops big in February, or did it? 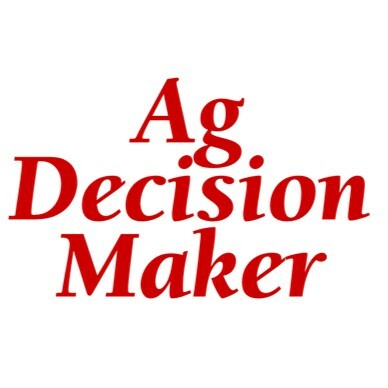 Ag Decision Maker website has a new look! Ag Decision Maker, one of the most visited Iowa State University Extension and Outreach websites, has a new look. The decision-oriented agricultural business website now showcases new and emerging issues within farm management. While the design of the Web page has changed, the Web address and the Ag Decision Maker purpose, to provide up-to-date information from agricultural economists at Iowa State University and other Midwest universities and institu­tions, remain the same. The site is designed for farmers, lenders, farm managers, agriculture instructors and others in­volved in agriculture. The site offers a wide range of business information on marketing, leasing, land values, legal issues, costs and returns, new business development, and many other topics. The Ag Decision Maker website provides assistance in a variety of ways. A six-page business newsletter is provided monthly that contains information and analysis of current business and economic issues. More than 430 Information Files provide in­formation and analysis for finding solutions to many of the decisions facing farmers and agri­businesses. Many of the Information Files have Decision Tools for on-line computation. Just enter figures into the spreadsheet to analyze individual situa­tions and save the analysis as a file with personal records. Teaching Activities are provided for use in the classroom. Voiced Media presentations offer further details on some Information Files. Outlook and profitability files on the website are updated on a monthly basis to show profitability for various crop and livestock enterprises. These files as well as links to the Iowa Farm Outlook newsletter, USDA reports and weather information can be found on the Outlook and Profitability page. AgDM posts timely tips throughout the month on a blog and through Twitter feed, @ISU_AgDM. The Ag Decision Maker website currently has over 3,200 visitors per day. These visitors spend a total of 500 hours on the site every day. Visit the site at http://www.extension.iastate.edu/agdm and bookmark it for future reference. Month­ly e-mail notification of new information posted to the website is available at no charge. Visit the “e-mail sign-up” link on the homepage for the online form, or e-mail agdm@iastate.edu. Leave a Comment on Ag Decision Maker website has a new look! Extension specialists discussed marketing options for poor quality grain and how crop insurance will address reduced value. They also examined potential feeding challenges of off-quality grain that livestock producers may face. In addition, ISU Extension and Outreach specialists looked to the future and provided the outlook for crop and livestock prices. They discussed planning for the 2013 crop, including the impact of drought on fall fertility decisions for the 2013 crop. Combine adjustments and harvest safety considerations during drought were also covered. Find responses to questions asked during the Webinar. The August updates from Iowa State University Extension and Outreach recently posted on the Ag Decision Maker website are now available! The August newsletter provides an overview of leasing issues for 2013, addresses drought related information on pricing silage, crop insurance, and increased awareness of field fires for harvest 2012. Drought related topics on cattle marketing decisions, weather-related sales of livestock, and updated historic basis files for Iowa corn and soybeans are including in the Information File updates this month. Also new this month are updated information on historic costs of crop production, including initial estimates for 2013, projected ACRE payments, and new information on the value of soil erosion. Notification of monthly updates are available, and free of charge. Want more information from Ag Decision Maker? Check out the Blog and Twitter sites for regular updates throughout the month!